...that Shuro Chi, Sedia, and Kalli are the 3 only known beings observed being freed from Taken corruption? "Crypto-archeologists decode the past and our enemies, seeking new discoveries in matter engrams and artifacts returned by Guardians." Master Rahool is an Awoken Cryptarch found at the Tower's main plaza. Rahool will decode any Engrams that the player has for free. In Destiny, he will also offer to exchange a number of legendary engrams for Legendary Marks. Besides being a Cryptarch, Master Rahool is also a historian and linguist. He makes mention of various artifacts from the Golden Age and beyond, particularly various religious texts. Rahool briefed a Guardian during their mission to the Moon to destroy the sword of Crota, Son of Oryx. He explained to them how the sword drained the Light the Guardians it killed, and that the sword was guarded by the Swarm Princes in the Hive's fortress. After the Guardian succeeded in killing the Princes and destroying the sword, Rahool congratulated them and noted that while many believed Crota would one day awaken and more weapons would be forged in his name, he believed that the destruction of the Hive Prince's sword brought humanity one step closer to reclaiming the Moon and defeating the Hive. When that same Guardian destroyed a Shrine of Oryx on the Moon, Rahool contacted him and noted that the exiled Warlock Vanguard Osiris had spoken of and feared the Hive god called Oryx and that his agents hunted for the shrines. He speculated that if Osiris still lived, he would know of the Guardian's heroic deed. After the Guardian killed a Cyclops and analyzed its mind core at a research station in the Ishtar Academy on Venus, they brought the data to Rahool for decryption. Rahool examined the Vex code and provided the Guardian with the information they needed to summon a Gate Lord. He asked the Guardian to return with other "amusing puzzles" in the future if they survived their fight. Rahool soon requested that the Guardian secure the Ishtar Academy's archives and prevent the Fallen from looting it, as it contained the work of some of the Golden Age's greatest minds and the Cryptarchs wished to study the data within. The Guardian succeeded in driving the House of Winter from the Academy's archives and their Ghost downloaded its contents for the Cryptarchs to study. Rahool was overjoyed by the information provided to them, especially about the Vex and the Vault of Glass, and he hoped to use this newfound knowledge to finally crack the Vault's secrets. Upon learning that the Guardian had breached the Cabal's Exclusion Zone on Mars, Rahool requested that they travel to Freehold and explore the ruins of Clovis Bray's offices there. As they journeyed to Mars, Rahool contacted them and explained that the Cryptarchy had wanted to gain access to Freehold's secrets for years and begged them to prevent the Cabal from destroying any of its technological wonders. While the Guardian prevented the Cabal from gaining access to technology there, the Warmind Rasputin took control of the machines there and locked out the Vanguard and Cabal from accessing them. Rahool was pleased the Cabal were stopped, but disappointed that Rasputin was not sharing the information within. Despite that setback, he remained optimistic about the other technology within Clovis Bray that humanity could access once more and hoped it signified the dawn of a new age for the City. Upon learning of Queen Mara Sov's supposed demise during the Battle of Saturn at the onset of the Taken War, Rahool decided to use the instability the Reef was experiencing as an opportunity to open new lines of communication between the City's cryptarchy and the Reef's. He wrote a letter to Master Ives expressing his condolences for the loss of Mara, but then informed Ives that he and the other City cryptarchs had been withholding knowledge about the history of Earth and its colonies, along with other sensitive secrets about the origins of the Awoken and others like them, from the Reef due to their fears of what the Queen would have done with that information. He suggested that with the Queen gone, they would be willing to share that knowledge for the Reef's own secrets and the promise of working together in future studies. During the Red War, Master Rahool fortunately survived the fall of the Tower and the Red Legion's invasion of the Last City. Once the City was liberated, Rahool returned to his duties at the new Tower, lending his decryption skills to the Guardians. Not long after returning to the City, Rahool received a reply to the message he had sent more than two years ago to Master Ives. The Reef cryptarch insulted Rahool for his blatant attempt to take advantage of the Reef's grief and asserted that the Reef held far greater knowledge than anything that could be found on Earth, although he accepted the offer to exchange information between the two cryptarchies. A year after the end of the Red War, Rahool watched discreetly as Paladin Kamala Rior of the Reef pleaded with Guardians in the Tower plaza to provided aid to the Awoken in the bid to retake the Dreaming City from the Taken. During the Festival of the Lost, Rahool learned from Amanda Holliday that Master Ives had been murdered in the Reef by the Fallen. 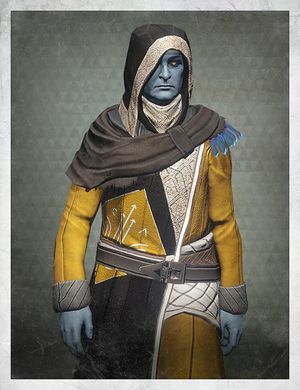 Despite the animosity between them, Rahool grieved for his fellow cryptarch and helped Amanda and the Young Wolf find leads that led to the location of Ives murder, a Captain of the House of Dusk named Kikliss. "Too noisy? You can't hide in the quiet of the archives all your life." "Ahh, good to get out amongst the people again... what on earth IS that!?" "Vex encryption. Unbreakable? Ha, so they say." "See here, this carving? Lion faced, Archon. Thousands of years pre-Collapse." "Found at the foot of the Great Pyramid. 755 feet to a side, 36,506 inches, less than a tenth of a degree from True North. Is that location significant? Ha! Everything's significant." "What does the manifest say. Late pre-collapse North American it looks like?" "These are forgeries. Someone is wasting our time!" "Oh the headache again. I swear it's these symbols, I see them in my dreams!" "Photographs, from an ancient handheld communications device of the day the Traveler arrived! What a find!" "Drifting out there, deep beneath dead oceans signaling all the while. And we, the first to crack it." "Oryx-Dead-King. Oryx Dead King, three words, nine word bursts over and over. Osiris?" "Brazilian from the morning of the Golden Age. What a hopeful text." "What does it mean? Signaling four hundred years in orbit. No language known in the archives." "Why a garden? Eden? Hesperides? Hesperides from Hesperus, Venus on Venus? No, no!" "Urd, Verdandi, Skuld. Old names for Earth, Mars, and Venus in the pre-collapse holy text." "House Winter, from the ruins of Caracas. Were they there at the Collapse?!" "A Wind Age, a Wolf Age; a presentiment of the Collapse?" "I've never seen anything like this. Thirteen parables, handwritten on the page." "Russian, from the evening of the Golden Age. Religious text I think." "Rasputin's fingerprints are all over this data. He doesn't even care if we know." "Civilization once stretched from the southern tip of this continent, to the frozen North." "Come back, before I get bored!" "From the North American Empire just before the Collapse. You can tell by the eagles." "Guardian, I don't suppose you speak Pre-Golden Age German? No, no one does." Urd, Verdandi, and Skuld are the Old Norse terms for "fate", "present" and "future", the names given to the Norns. Roughly analogous to the Greek Fates, the Norns are three figures from the Völuspá, a poem in the Poetic Edda, which is possibly the religious text in question. According to this poem, the Norns sit at the base of the World Tree,Yggdrasil, weaving its roots into a tapestry which tells story of all Mankind; past, present and future. "A Wind Age, a Wolf Age" is drawn directly from the Völuspá, specifically verse 45, concerning Ragnarök's aftermath. The terms were also used in Bungie's Myth series. The Hesperides were nymphs who tended to a blissful garden. They were daughters of Hesperus the Evening Star, also known as the planet Venus. There is a pile of remains in the Skywatch that if disturbed will say "A million deaths is not enough for Master Rahool." This is a reference to the loot cave, where players would farm for engrams in the cave.